Missouri was named by the neighboring Indians in Illinois, who called the Native Americans in that region near the Missouri River, “Ouemessourita”, which means “those who have dugout canoes”. The word Missouri pops right out of that. There is some debate on the pronunciation of Missouri, but it basically comes down to whether the speaker is from east “Missour-ee”, or west “Missour-uh”. The folks there know the difference. What they have in common though, is that it is a whole lot easier for car shippers in the extreme eastern part of the state, St. Louis, and the extreme western part, Kansas City. Those two metropolitan cities make it easy for Missouri car shipping companies. Where Is The Best Car Moving Place In Missouri? 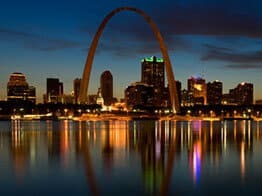 The answer must be St. Louis, the Gateway to the West when it comes to Missouri car shipping. No less than four major interstates converge on Saint Louis. The most notable is I-70, which is a major U.S. artery that travels coast-to-coast, east to west. The highway I-64 dead-ends in St. Louis, after making its start in Newport News, Virginia. So that’s a pretty good run almost halfway across the country. And just as I-64 ends there, another begins as I-44 takes off in a southwestern direction. It will end in Wichita Falls, Texas after a relatively short stint. But wait … there’s more. I-55 intersects St. Louis as well, after starting in Chicago. On game day that highway gets lit up with the Chicago-St. Louis rivalry. Unlike I64 and I-44, however, I-55 keeps going until it hits the Gulf of Mexico. All of that makes St. Louis an ideal place for auto transport companies, who can more easily amalgamate loads or switch directions at the drop of a hat. How About Moving A Car To Kansas City? Always the bridesmaid and never the bride, Kansas City often gets overlooked in favor of the larger St. Louis. But there’s a reason Kansas City has two major sports teams, it is also a big metropolitan area that if you look at the map, just might be the last significant stop before the traveler reaches the Rocky Mountains. And that’s a long way down the road. So Kansas City is plenty important in the car moving business. It is a really good place to ship a car. I-70 is a straight shot across Missouri from St. Louis. I-35 comes in from the states north, Iowa and Minnesota. I-29 does the same from the Dakotas and Nebraska. I-49 makes its introduction in Kansas City and heads south. So there are plenty of ways to skin that cat, most of them good. Our recommendation is that if you are in western Missouri and maybe even eastern Kansas, you will have better luck with your vehicle transport in Kansas City. So try to meet a driver there if you want to go quick. How About Missouri Car Transport Elsewhere? First the good news: The southwestern corridor along I-44 through Springfield and Joplin works fairly well for Missouri car shipping. Not great, but not bad either. So you should have okay luck shipping just about anywhere from there. Now the bad news: Northern Missouri is very rural and spread out, which makes it difficult to ship in a timely fashion. Our car shipping quote calculator reflects that problem by trying to entice a driver off I-70 or I-35 to come fetch your car. Sometimes it works, sometimes it doesn’t. The same holds true in western Missouri just below Kansas City and north of Springfield. We again attempt to coax a carrier off the highway with slightly higher auto transport quotes. The real dilemma, however, is southeastern Missouri near Cape Girardeau and the Ozarks. We know there are lots of folks down there and a very cool place to live, but it sure is hard shipping a car fast in that region. We really try our best to encourage a driver to fetch a vehicle there, but no matter the price, our car shipping quotes calculator can only do so much. Usually a vehicle there is by itself shipping anywhere else, or so it seems. So pick your poison. Sit and wait, or meet a driver in St. Louis, Memphis or Nashville. Direct Express Auto Transport came up with a car shipping rates estimator online before anyone else. We also perfected it. There is far more involved than meets the eye as we strive to produce auto shipping cost estimates that a customer can count on. Ordering online is a snap. We accept all major credit cards for the nominal deposit and the balance is paid in cash or money order after your vehicle is transported and delivered. In Missouri they might say, “show me the car and I’ll show you the money”. Call our customer service representatives for good advice at 800-600-3750 to ship your car today! You can also visit Direct Express Auto Transport to fill out a simple form and get a free car shipping quote. We make it easy to book your vehicle shipment online.